I don't know much about Metamorpho - other than the fact that he's one of the coolest action figures ever. The "build-a-figure" (BAF) concept is probably the most significant innovation in the action figure industry since the Constructicons first came together to form Devastator. Popularized by ToyBiz during their Marvel Legends years, collectors have been treated to gigantic BAFs such as Galactus, a Sentinel, and Pitt. 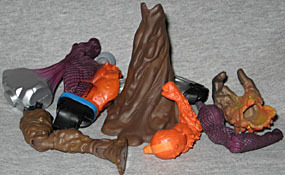 Here's how it works: each character in a particular wave of action figures (in this case, five figures) comes with a piece of the BAF - an arm, a leg, an accessory, and so forth. By buying all the figures, you get to build a sixth figure. This does a few things. It encourages collectors to buy all the figures in the wave, rather than cherry-picking it for their favorites; it helps justify the $10 price tag on a lot of these toys; and most importantly, it helps collectors get a figure they might never have seen at retail, either because it was too large (a separate Sentinel or Pitt in its own packaging would probably run $30-$40, much too high for most mass market retailers) or too obscure to produce, like Metamorpho here. Years ago, Rex Mason was a soldier of fortune extraordinaire. Adaptable to all cultures and circumstances, no treasure was beyond Mason's reach. Believing he'd found his big score, he accepted a mission to unearth the fabled Orb of Ra within the pyramid of Ahk-Ton. Mason succeed - only to have it stolen moments later by a jealous assistant. Left for dead inside the pyramid, Mason was exposed to the radiation of an ancient meteor buried there, a radiation that saved his life - but left him permanently and tragically transformed. When he awoke, he found himself hideously altered, the chemical components of his body scrambled and remixed into a freakish form. Metamorpho can transform himself into any element or compound found within the human body, from a fluorine cloud to an iron-cobalt battering ram. Unlike many BAFs, Metamorpho isn't particularly large. (The BAFs for the next two DCUC waves, Gorilla Grodd and Solomon Grundy, are much bigger.) 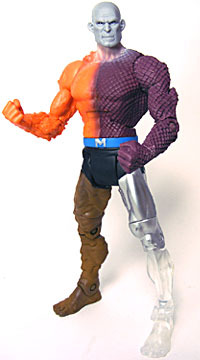 I'm guessing Mattel decided to make him the BAF for a few reasons: to try the concept out with a smaller figure; to allow for him to have some large accessories; and because Metamorpho may be too obscure to warrant his own figure in the line. Incidentally, the packaging refers to him as "Rex Mason, the Element Man" rather than "Metamorpho," despite the fact his belt has an "M" on it. This is because the name "Metamorpho" is trademarked for use on action figures by another company. Metamorpho has some of the best sculpting in the line. Not much body re-use here, either; because he's the "Element Man," he has tons of texturing, from the rockiness of his right arm to the scales of his left and the muddiness of his right leg. The transition from the Horsemen's prototype to the retail figure has gone well, and the detailing on Rex is almost as good as what you'll find on a specialty market figure. Too often I think I tend to overlook some aspects of a figure because, well, I'm just not that picky sometimes. While the "toyish" feel of Red Tornado bugged me, I really like the orange plastic used for Metamorpho's lava-like right torso and arm. It reminds me of the old Crystar action figure Moltar. The left leg, which blends from silver to clear, is another great touch. Watch out for that leg left, though. Mine was a bit warped, and judging from collector comments, this is a pretty common flaw. Thirty seconds in a pot of boiling water (and be sure to hold it in there with tongs or something - if you just drop it in, it could melt against the bottom of the pot) will clear up the warping. I love the paint work, at least in terms of color and texture. But the purple on his chest does bleed a bit too far onto the right side (though personally, I can pass this off as a natural result of his metamorphic nature), and the brown paint on the "muddy" leg is a bit too thick. I'm also not totally in love with his head sculpt - those are some big ears - but what really weirds me out are the eyes. They're black, with white pupils. I've done some image searches and haven't found too many with good looks at Rex's eyes, but I'm not sure whether this is a normal look for him. The beady eyes give him an inhuman aspect. Metamorpho gets the standard DCUC articulation - balljoints at the neck and shoulders, hinge joints at the elbows, knees, ankles and abdomen, post-hinge joints at the hips (for balljoint-style range of motion), swivel joints at the wrists, biceps, thighs and waist, and slight side-to-side motion on the ankles for balance. Since Metamorpho is a BAF (or a "Collect & Connect" figure, for legal purposes), many of the joints aren't as tight as they would be on the other figures in the line. The arms and legs snap into the shoulders and hips, respectively. On my figure, the left leg tends to pop out easily - and apparently this is a pretty common issue. There's a hex-wrench-shaped disc inside the hip well that moves independent of the crotch; if you put some glue along the sides of the left leg's peg, you can glue the leg in firmly without losing any of the articulation. He just won't come apart again. Metamorpho features three huge accessories courtesy of his BAFhood. The first is a display base for his "muddy" leg, which his foot snaps into. The others are a lava-like giant hand for his right arm and a sledgehammer for his left. Both are sculpted to look as though they've grown out of his arms, rather than being accessories he's holding in his smaller hands. The paint work on them is fantastic, especially the detailing on the "lava" hand. Mattel has had their issues with the collectors' market. Or perhaps I should say, the male collectors' market. It seems they've got a good handle on people who collect Barbie dolls. But since they began dabbling in the world of adult action figure collecting, they've had some very mixed results. Hiring former McFarlane Toys sculptors the Four Horsemen to revamp their Masters of the Universe line for a new generation, and promoting their hiring, was a master stroke. But production problems - from scaling issues with the figures themselves to terrible, terrible casepacks and distribution - dismayed collectors even as the cartoon failed to click with children, dooming the line. When they scored the various DC licenses, Mattel wisely turned to the Horsemen again for the sculpting duties. The results, again, were mixed - for every Zipline Batman, there were at least half a dozen lame variants ("Street Luge Batman," anyone? ), while the three coolest figures in the line - Bane, Bat Signal Batman, and Attack Armor Batman - were released overseas but not in the U.S. Wha-huh? When the Batman line morphed into the DC Superheroes line, things slowly began to improve. Mattel re-released earlier, hard-to-find figures such as Bane and Mr. Freeze with added articulation. Then along came wave two's Superman - one of the finest action figures I've ever owned and a milestone in action figure history. Each successive wave of figures has kept that magic for me. This hasn't happened with a lot of the other toys I've bought (most notably Marvel Legends and Legendary Heroes), but Mattel did it. Here's to a bright future for DC Universe Classics!